Looking for the perfect last minute gift? Rewarding Times has teamed up with Dawson Jewellers, (21 Dawson St, Dublin 2) to offer you another exclusive gift this Christmas. This stunning pendant, of halo set diamond-cut cubic zirconia created in 9ct white gold, is the perfect, bespoke, gift for that special someone this Christmas, with the brilliant stones catching every light with every movement. 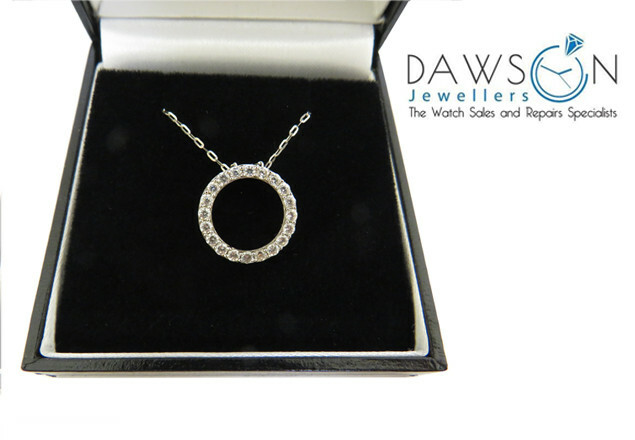 Dawson Jewellers and Watch Specialists is a family run jewellers located in the heart of Dublin City Centre. For over thirty years Dawson Jewellers has been creating the most exquisite bespoke pieces of jewellery for our clientele. We can guarantee our customers that only the highest quality precious stones, diamonds and metals are used in our engagement rings, wedding bands, pendants, bracelets and earrings. Our team of experts are amongst the most highly skilled goldsmiths in the country, creating the most exquisite jewellery in Ireland today. As each individual piece in our collection is the result of our thirty years’ experience this offer provides you with the perfect opportunity to enjoy a gorgeous and unique design at a very special price. Vouchers will be available for redemption once the offer closes at midnight Sunday, 18th December. For guaranteed Christmas delivery - please email Dawson Jewellers by 20th December, with your Name, Voucher number, and delivery address. Items may also be collected, in person, from Dawson Jewellers up until Friday 23rd December.